The top floor of the Fabric Workshop and Museum is currently devoted to Cynthia Hopkins’ Memorabilia, an elegiac requiem for five of the Brooklyn-based artist’s previous performance pieces. 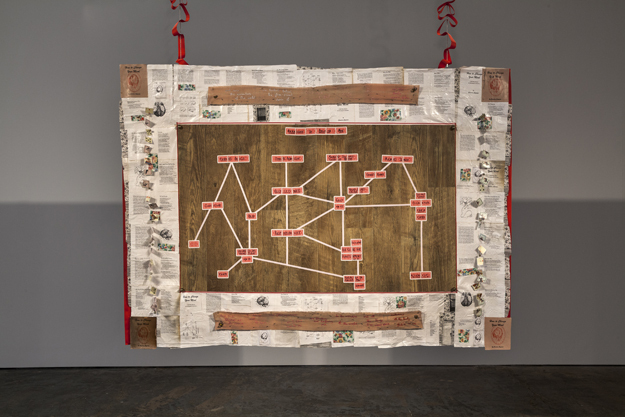 Known for her large-scale, musical, and highly theatrical performances, Hopkins now memorializes her past works in five suspended quilts, corresponding texts, and a sound piece providing continuous musical and oratory narration. The five performances to which this show gives tribute present, in their memorialization, a personal narrative that expands and contracts in scale, tracing a migratory lineage of the artist’s preoccupations and concerns. Hopkins’ soundtrack, a mesmerizing loop of song and hypnotic speech, invades you as soon as you enter the exhibition space. Sound fills the gallery completely, plays without pause, and seems indeed to permeate your very body. Hopkins’ dulcet and omnipresent tones shift in register as you wander among her five quilts. Sometimes a friendly, helpful guide, the sound often moves beyond an explanatory narrative to achieve a profound sense of reverent spiritual gravity. Spend enough time in the gallery, and the pervasiveness and persistence of Hopkins’ voice may start to overwhelm and oppress. The sound is also a reiteration of Hopkins’ text, which is handwritten on the gallery walls in colorful paint. Both iterations accompany the quilts, sometimes venturing explanations, sometimes recreating scripts from the original performances. 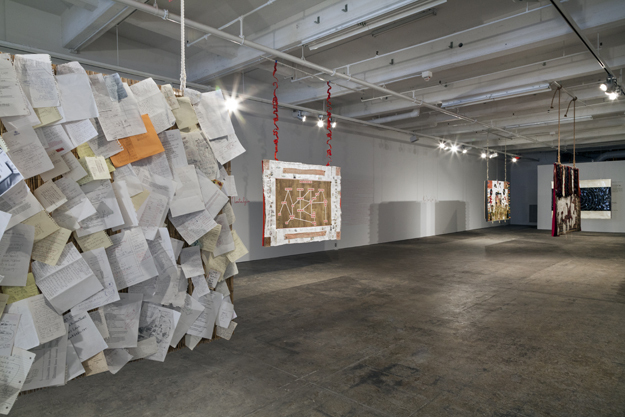 Meanwhile, the quilts themselves act as repositories for the material detritus of the performances, assembling props and visual scraps, notes, and drawings into panels that communicate stories without acting them out. They effectively function like memories, as histories in composite form. They are also devices for the memorialization and recollection. In The Success of Failure (or, The Failure of Success) Memorial Quilt, a diagram maps out personal and familial failings and redemptions. 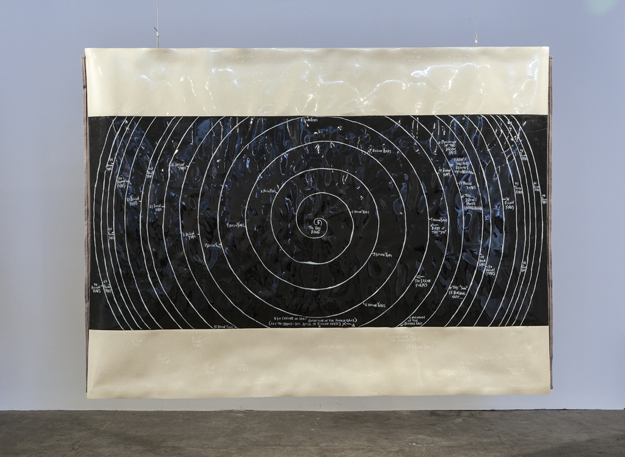 Its verso (all of the quilts are double-sided) is a schematic reconception of a more expansive collective history: human, world, and universe. A spiral pattern formats this history, situating the human as a mere moment in a duration by which it is both preceded and surpassed – this juxtaposition of personal narrative with extra-anthropocentric history is one of Hopkins’ many plays on scale throughout the show. Hopkins’ approach to the specific demands of this show alludes to the impossibility of translating performance work into representation. 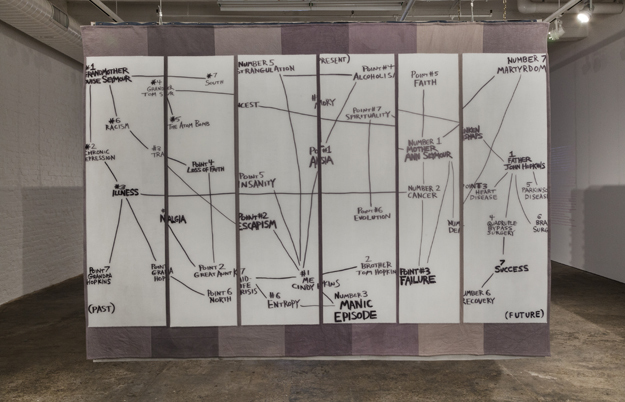 In Accidental Nostalgia Memorial Quilt, her attempts at psychological mapping – which take the form of a causal chart of traumas and neuroses – are a futile imposition of order onto material that remains a hopelessly indecipherable blend of fact and extravagant fiction, as is also the case in the 2006 Accidental Nostalgia performance. In a similar vein, Hopkins’ vocal narrations at times become unintelligible as her speech speeds up and sounds reverberate around the brick-walled exhibition space. While the Fabric Workshop kindly provides headphones so that visitors may listen to the soundtrack sans interference, it is difficult not to view these periodic dissolutions into incoherence as integral to the work and the problems posed by representing performance. The show might best be thought of not as an archival presentation of the artist’s performances, a method pursued so frequently by museums and galleries, but rather an act of shedding or a “getting rid of,” as Hopkins herself mentions in her relentless monologue. As such, considerations of death – her own, her father’s, humanity’s – mortality, and rebirth that recur throughout the show find a fitting parallel in the terminality inherent to this exhibition. This Clement World Memorial Quilt, for example, enacts a fantasy of human extinction. The piece documents the narrator’s fixation with climate change and desire to outlive our collective demise in order to to experience a new world unburdened of humanity. 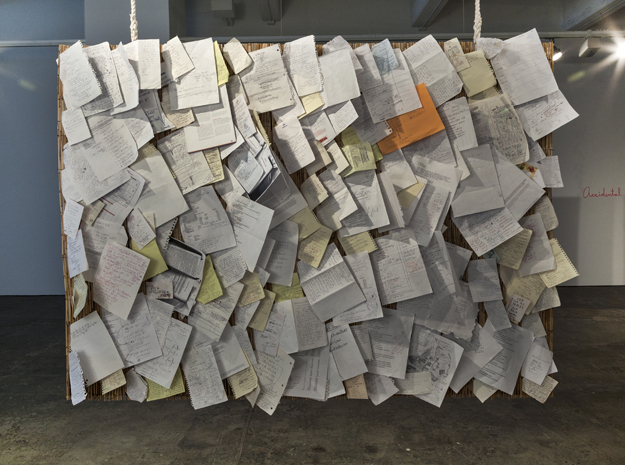 The quilt is composed on one side of a dense mass of notes on assorted scraps of paper, taken while the artist was researching climate change for the original performance. The other side is an Astroturf ground framed in bamboo caning, upon which a few small mounted antlers are placed. A white diagram charts the narrator’s wish to live long enough to pass through to the other side of the anthropocene. Like This Clement World Memorial Quilt, the exhibition as a whole, though fixated on the past, incites imaginings of a future after the end. But despite this exploration of futurity, the overwhelming mood of the show remains one of melancholy, even disappointment. A series of scrapbooks of original performance, it leaves us wishing the performance back to life in its stead. That is, after all, the nature of memorials. Kirsten Gill is a graduate student in the History of Art at the University of Pennsylvania.